Baron Waldstein visited the grove at Nonsuch Palace in 1600 and admired the polychrome statues of three naked goddesses spraying Actaeon with water (Strong, 1979). The Baron remarked that "nature' was "imitated' with the greatest skill. He thought the grove "natural' because it was the kind of scene that the ancients would have appreciated. So too have the moderns. Themes from classical mythology have reminded gardeners of what Sir Kenneth Clark described as the myth of "a golden age when men lived on the fruits of the earth in peace and simplicity' ( Clark, 1976). Gardens, antique shops, and garden centres are filled with casts of Diana, Venus and other classical figures. The Gods of Antiquity dominate the history of western garden sculpture. Since Varro, the Roman poet, hailed Venus as the presiding deity of gardens, she has been blessed with a long and prosperous reign. Katherine T. von Stackelberg (p.27 in The Roman Garden, 2009) writes that 'The most popular subject for both sculpture and painting was Venus, the goddess of gardens'. Other gods have jostled for power but Venus still rules in a multitude of verdant kingdoms. Diana also has an honoured place. Having seen her mother suffer in childbirth, Diana obtained permission from her father to live in celibacy, and became a symbol of purity and virtue. Some males, like Mercury and the heroic gladiator, have challenged her ascendancy. None will triumph. The gardens of Renaissance Italy were outdoor "museums', in the original sense of "homes for the muses'. Classical learning was rediscovered from ancient books and manuscripts. Music was played. Poetry was read. Classical sculptures, excavated from the ruins of Greece and Rome, were displayed in gardens. The Belvedere Garden in the Vatican was adorned with the most famous statues from ancient times. Princely families, like the Medici, the Estes and the Ludovisi, obtained what statues they could from the ruins. When Lorenzo de Medici discussed the philosophy of Plato, in his garden, classical statuary was an aid to contemplation. A taste for placing classical statuary in gardens spread with the Renaissance to northern Europe. The first great set of casts was made for the garden that Francois I began at Fontainebleau in 1528. Garden design became a royal art, and collecting sculpture became a competitive hobby. Francois' rival, Henry VIII of England, placed sculpture in his garden at Nonsuch, started in 1538. Louis XIV assembled a vast collection at Versailles, and his admirer, Charles II, had casts of antique statues made for his London gardens. When Inigo Jones and Lord Arundel returned from Italy in 1614, they had acquired a love of classical sculpture. A magnificent collection was assembled in the garden of Arundel House. It was the first museum garden in England. Unfortunately, the marble statues could not withstand the English climate. They now reside in Oxford's Ashmolean museum. Garden sculpture fell into disrepute during the English Civil War. A biblical injunction not to worship graven images was remembered. Pagan gods were despised. Symbols of monarchy were destroyed. The Cheapside Cross in London was melted down "with ringing of Bells, and a great acclamation' as part of a campaign to rid London of "leaden Popes'. Lead garden statuary was made into musket shot. Thus were graven images made to serve the puritan cause. A few musket balls have found their way back into garden ornaments, one may speculate. The use of sculpture in English gardens revived after the restoration of Charles II in 1660. From this point until the end of the eighteenth century, "English' garden sculpture is largely the story of north European migrants making copies of Greek statues, Roman statues, and Italian Renaissance statues. Classical goddesses were given key positions on terraces, where paths meet and where avenues terminate. Statues of nymphs, cherubs and animals had less formal positions. Lions stood guard on steps. Dolphins leapt in ponds. Un-water'd see the drooping Sea-horse mourn. The victim of Pope's satire may have been the Borghese Gladiator, though he was in the best of health, or the Dying Gladiator, who was to be seen dying amid the flower gardens of the 1720s. Pope's attack had deadly consequences for the Enclosed Style of garden design, but no immediate effect on England's population of gladiators. There is a stone copy of the Dying Gladiator at Rousham (Figure 5). It was made by Peter Sheemakers, who was born in Flanders and, after some years in Rome, spent the remainder of his life in England. Rousham also has a collection of work by Henry Cheere, of French descent, and by the Dutchman John van Nost. There are copies of the Dancing Faun, Venus, Apollo, Ceres, Pan, and Mercury. It may seem surprising that there is so much classical statuary in this ancestor of all the world's landscape gardens, but in its Augustan phase the English landscape garden was a concerted attempt to re-create the landscape of antiquity. The pantomime diversity of late-eighteenth century garden statuary is revealed by Cheere's advertisement. He offered "the Gods of Athens, and of Rome' with "Punch, Harlequin, Columbine and other pantomimical characters; mowers whetting their scythes, haymakers resting on their rakes, gamekeepers in the act of shooting and Roman soldiers with firelocks'. They were painted in bright colours, more reminiscent of The Rake's Progress than the austere eighteenth century gardens we see today. Nor did Cheere neglect the slave trade. A popular model, which is still being made, has a Nubian on bended knee supporting a bird table or sundial. War with Napoleon led to the closure of London's lead-casting yards, as another war had done in Cromwell's time. It was reported that, once again, "whole regiments of leaden Venuses, Moors, Jupiters, angels, saints, nymphs, and fauns were converted into bullets'. It is regrettable that so little original sculpture was produced for gardens, but there is no reason whatsoever to despise the use of copies. Statues look marvellous out of doors, and it would often be vandalism to expose an original work to the elements. One tends to be further away from garden statues than from museum statues, and it is the garden rather than the statue that is the original work of art. A copy will give a better impression of a statue's three-dimensional quality than a book illustration, which might be the only other way of knowing a famous work. A refreshing trend, in the second half of the nineteenth century, is that new sculpture began to be commissioned for special locations. Waterhouse Hawkins, an artist and anatomist, made a lead bull for the Chinese section of the garden at Biddulph Grange, and a series of prehistoric monsters for the Crystal Palace at Sydenham. John Thomas carved 26 statues representing different countries for the upper terrace at Sydenham. Thomas also made neoclassical works for the splendid water feature in Kensington Gardens. Their character is "Italian' rather than "classical'. All these projects arose from the Victorians' thirst for knowledge about foreign lands, past times and exotic cultures. How sweetly bloom'd the gay green birk! How rich the hawthorn's blossom! I clasp'd her to my bosom! Was my sweet Highland Mary. The New Sculpture of the late nineteenth century was concerned with the representation of ideas, and was well suited to outdoor display. 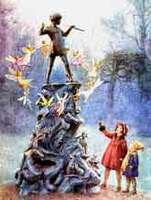 Disappointingly little was placed in private gardens, but there are some successful examples in public parks, including George Frampton's Peter Pan (Figure 6) and G.F. Watts' Physical Energy in Kensington Gardens, and William Hamo Thornycroft's Sower in Kew Gardens. Reginald Blomfield and F. Inigo Thomas, both closely associated with the Arts and Crafts movement, published a book on The Formal Garden in England. The terraces and courtyards that they advocated led to many opportunities for the display of garden sculpture. One of the most interesting projects was Barrow Court. Inigo Thomas designed the gardens and introduced Alfred Drury. Drury was a brilliant sculptor and made twelve busts, one for each pier of the railings round the semicircular entrance court. They represented the twelve months of the year by showing the life cycle of a girl from infancy to old age. Arts and Crafts sculptors were attracted to animal sculpture, and many examples found their way into gardens. A new generation of sculptors and garden designers came to the fore in the 1930s. They were influenced by the Modern Movement in art and design, and hoped to create a startlingly new abstract art. English sculptors, led by Henry Moore and Ben Nicholson, became leaders in this new art. But English garden designers had scant success in attracting the public to the abstract style of garden design, though it was widely adopted in continental Europe and the Americas. In England it remained a style for architects and their more avantâ€‘garde clients. At Bentley Wood in Sussex, the purest example of a Modern Movement garden in England, the house was designed by Serge Chermayef, an architect, for himself, and the garden by Christopher Tunnard, who wrote an influential book on the future of garden design. The plan of the garden was influenced by a Henry Moore sculpture, his Recumbent Figure, which stood in the garden. Modern sculpture can be difficult to place in gardens, because it is less well understood than classical sculpture. The shock of the new persists. But much can be learned from the ideas of leading sculptors. The Japanese-American sculptor Isamu Noguchi hardly distinguished between the two arts. His courtyard for the library at Yale University can be regarded either as sculpture or as a sculpture garden. Nogucci wrote that "I like to think of gardens as [the] sculpturing of space'. So should we. Henry Moore, at the start of his career, felt uneasy about placing sculpture in gardens. He felt that a sculpture lost its independence by becoming part of a garden design, and he remembered the old days when sculptors had worked to the dictat of architects. But he loved to place sculpture in the landscape and, towards the end of his life, placed a considerable number of works in his own garden (Figure 7). Anthony Caro remarked that "sculpture... more often than not spoils the landscape'. This may be because his own constructions represent abstract space, which can conflict with an existing space. In gardens, it is likely to be the space itself, rather than a sculpture, which is the primary work of art. Modern sculpture makes use of a great range of materials, which behave in different ways out of doors. Coloured fibreglass tends to fade, and the fibreglass itself is gradually decayed by ultraviolet light. Wood is a natural material for outdoor use. It must be expected to change and decay, but this can be regarded as part of the sculpture's nature. Mild steel, as used by Anthony Caro and others, is prone to rust unless painted or galvanized. Stainless steel, if it is of the best quality, will retain its high polish indefinitely. Ceramic sculpture is extremely durable. Fresh materials can certainly be placed in gardens. A new marriage between sculpture and garden design would inject vitality into both arts.